Formerly known as Saigon, Ho Chi Minh City is characterised by a vast array of sights and sounds: a fascinating blend of old and new, East and West. The huge number of people rushing about their daily lives in Vietnam's largest city gives it a dynamic atmosphere and the French influence is evident in the excellent baguettes and coffee on offer. Much of the city's life takes place on the busy streets lined with shops, stalls and vendors with their wares spread out on the footpath, selling everything from soup to sophisticated electronics. Visit the famous Cu Chi tunnels. This former Viet Cong stronghold provides an insight into the resourcefulness and tenacity of the Vietnamese people, as well as a unique sense of what underground life was like during the American War. Experience the hustle and bustle of old Saigon in cyclos (bicycle rickshaws) and explore some of the city's more interesting sights, including the War Remnants Museum. 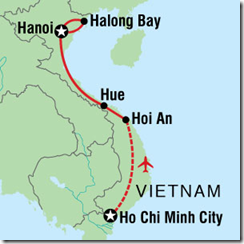 Take a short flight to Danang (approx 1 hr) and then drive to Hoi An (approx 1 hr). It's also a shopping mecca - with much to browse and buy. Choose from original paintings, handcraft woodwork, ceramics, embroidery, lanterns and more. Hoi An has also become famous for its tailoring - with a great variety of fabrics and tailors to choose from. Bring your favourite piece of clothing or even just a picture, and you'll be able to have it copied. Your leader will take you on a walk around the Ancient Town. 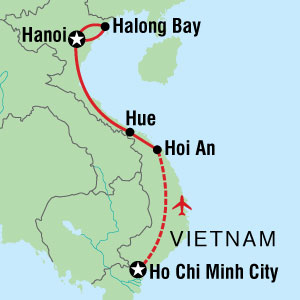 Departing Hoi An, we can stop at China Beach before crossing the dramatic Hai Van Pass to the picturesque fishing village of Lang Co. After a quick stop, continue on to Hue (approx 5 hrs including stops). The pace of life is slow and tranquillity prevails in Hue - the former imperial capital of Vietnam. Founded as a royal city in 1687, it's the gateway to the treasures of Vietnam's royal past. Hop on to your cyclo for a tour of the city - a truly fun and Intrepid way to explore the town. Visit the Imperial Citadel, including the Forbidden Purple City. The latter was almost totally destroyed during the American War's Tet Offensive, but the foliage-covered ruins are still atmospheric and the gaping holes left by bombs give an idea of the destruction wreaked upon the country during the war. Enjoy a dragon boat cruise on the Perfume River. The trip includes a visit to Thien Mu Pagoda, considered by many to be the unofficial symbol of Hue. It's an active Buddhist monastery with its origins dating back to 1601. One of the most poignant displays is a car belonging to a former monk who, in 1963, drove to Saigon and set himself alight to protest against the treatment of Buddhists by the South Vietnamese regime. We also visit one of the royal tombs, that of Emperor Tu Duc, with its central lake set amid a grove of frangipani and pine trees, and we may visit what many believe to be the most majestic of all the royal tombs, Minh Mang. The bustling Dong Ba Market offers a plethora of goods and foods to see and sample, and it's a good place to try some of the specialities that graced the Nguyen emperors' banquet tables, such as the banh khoai, a royal rice cake. Board an overnight train to Hanoi. Although conditions are basic, overnight trains are a true Intrepid experience and the best way to travel long distances with the locals. Sleeper trains typically have four berth compartments (occasionally six berth depending on seasonal variations), which have bench seats that convert into sleeping bunks. A sheet, pillow and blanket are provided, although some travellers prefer to bring their own sleeping sheet. On occasion, passengers of different genders will be required to share a compartment and there will be occasions where you'll be sharing with local travellers or travellers who are not part of your group. Most trains have a dining carriage serving simple food, but some travellers take the opportunity to stock up on fresh bread, cheese and fruit prior to departure. We arrive in Hanoi early in the morning. Enjoy a buffet breakfast at KOTO restaurant, one of Intrepid's Responsible Travel supported programs which aims to teach street children hospitality skills that will enable them to find employment. The rest of the day is free to explore the city. Venture into the atmospheric Old Quarter to see the Vietnam of old, stroll the tree-lined boulevards to admire the French architecture or visit one of the many museums for some insight into the country's turbulent history. The afternoon is free for you to explore this delightful city. Why not stop for a bia hoi (freshly brewed draught beer) at one of the microbars in the Old Quarter or relax at a cafe.